A new study by Jane Arnold Lincove and Jon Valant, released in partnership with the Urban Institute, examines how much time students spend on school buses and how early students’ commutes to school begin. 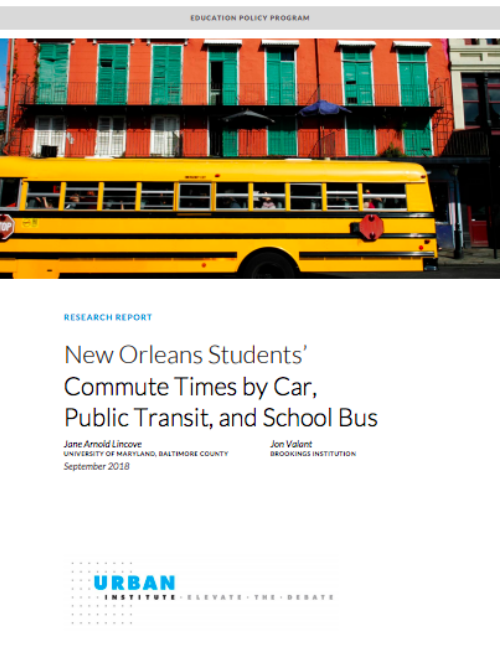 The study analyzes bus routes from seventeen New Orleans schools between 2015-2017, and finds that the average trip from a student’s bus stop to school lasts 35 minutes. Round trip, this means that the average student spends approximately six hours per week on a school bus. Students commuting by car travel, on average, 14 minutes to get to school, and those who commute by public transit travel 47 minutes to school on average. The study also examines how early students’ commutes begin and find that the majority of pickups occur between 6:00 a.m. and 7:00 a.m. Although relatively few students have pre-6:00 a.m. pickup times, there are some students who need to arrive at the bus stop before the sun rises, some as early as 5:00 a.m.